Road trips to the beach are one of my family's favourite summer activities! We are lucky to have a lovely beach within a few kilometers of home. We do love to roadtrip to the great lakes to one of many beautiful and exciting spots. For those trips, 3 kids 5 and under can be a bit much to say the least. Until someone invents a limo type retractable window to separate the front and back seats, we are sometimes stuck with the sibling bickering (like arguments about whether or not their are alligators swimming at the conservation area) and other crazy noises that don't even sound human sometimes (our daughter has a promising future career as a voice actor). Enter Deb's Storytime Adventures . Deb has amazing audio stories for children that are entertaining and help their imaginations run wild. There are no books to drop (or fight over), so that means you wont have to pull over 18 times an hour to search through the goldfish cracker crusted bottomless backseat floor and there is no need for the screen time guilt. And most importantly, the kids are quiet and engaged in the stories. Deb is an incredible local children's performer who I am fortunate enough to call a friend. For more info or to download the stories checkout Deb's site here. I absolutely love selecting gifts for kiddos. The excitement starts as soon as my little ones receive a birthday invite. In fact I could spend an afternoon browsing in a toy store (with a hot coffee in hand) even without my children. We are lucky to have a great independent toy store in our local mall Toy Tales. If you are in the Cambridge area, I recommend that you check it out. It has great selection and it feels so nice to support local business! I digress.. 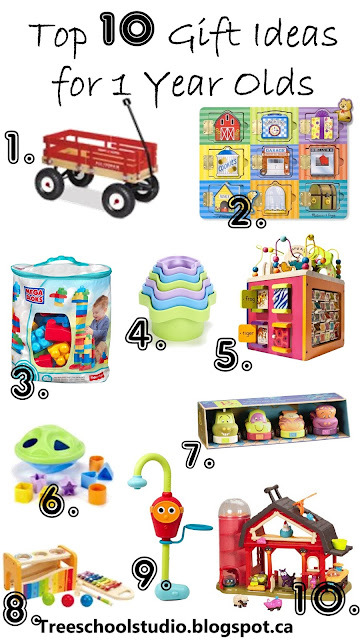 I have realized as of late that many adults do not share my zest for toy choosing gifts for children and I thought I would share this list. These are all amazing gift ideas that my children received (and LOVED) for their first birthdays. * NOTE: This blog post was not sponsored by any company and all ideas and opinions are my own and are based on my family's experience with these products. A little red wagon is a classic first birthday gift and for good reason. First off, wagons are actually practical. They are great for transporting kids on evening strolls or for carrying a ton of stuff for picnics at the park. Second, they will be used for years by you and your children. 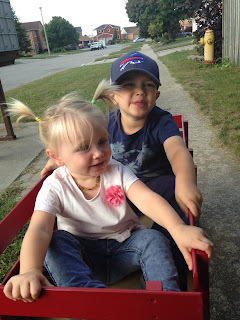 Mr. Jeej loves to go for wagon walks so he can pull his little sister. I highly recommend the Radio Flyer All Terrain Cargo Wagon, it is a little pricey, but it may be a great group gift option. The wheels are inflatable which is great for a smooth ride, it stores very nicely in tight garage spaces, and the rails easily slide in and out for easy access. For a tighter budget, the Little Tykes Little Red Wagon is also a great option. This wagon is designed specifically for toddlers to pull and it can be used indoors as well as outside. Mr. Jeej and E fill it with stuffed animals and pull it around for hours! It's not meant for children to ride in , but there is definitely a bit of sister towing happening with this wagon, which is fun.. but definitely not recommended by the manufacturer. Puzzles are a great gift for one year olds as they have high educational and play value. They are great for helping little hands develop fine motor skills, for aiding in hand eye coordination, developing early logic skills and with the availability of a wide range of themes puzzles are great for the development of vocabulary. The littles love the Melissa and Doug Hide and Seek Board, which features magnetic pieces that an be matched by colour or subject matter, the doors are really fun for little ones to open and close. Melissa and Doug also make a similar Farm themed hide and seek board. For more traditional puzzles, Melissa and Doug make a variety of chunky wood puzzles, some adorable options include insects and safari animals. Building a tower and then knocking it down is literally the most fun activity for a one year. Some days I feel like Baby E could do it a hundred times in a row. Besides intense entertainment value, nesting cups or blocks are a toy that can be used in many imaginative ways and if you choose a plastic set, they also make a great bath toy! Two great (and budget friendly) options are the green toys nesting cups and the Melissa and Doug wooden nesting blocks. 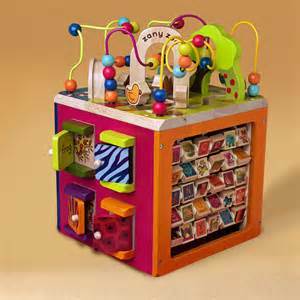 There is a reason that nearly every dentist and doctor's office in North America has an activity cube in their waiting room, they keep little hands busy! The B. toys zany zoo is full of surprises for one year olds. It features door with animals hiding behind, alphabet tiles that feature pictures on the back corresponding to each letter, a bead maze, an animal race track and spinning animals. Aside from being fun to play with, it actually looks good too. In our house we LOVE B. toys! They are a unique Canadian toy company that donates a portion of their sales to the charity Free the Children and are environmentally friendly in their packaging and material choices. A shape sorter is another classic gift for a one year old and rightly so. Shape sorters help little ones develop logic and fine motor skills while introducing them to the concept of shapes. We have the Green Toys version, which the kids love because its so portable and light and I love because whenever it's dirty I can throw it in the dishwasher (like all Green Toys Products). There are also tons of great options in different shapes and price range such as the Hape shake and match or the . My kids also love the Melissa and Doug Safari Truck , it can be used to sort the animal shapes and also as a make believe toy, plus it seems like wheels make anything more fun! Cars are a must have for any toy collection, both of my little ones enjoyed car play at age one (and still do). B. Wheeeels cars come in a set of 4 baby friendly cars, each with a unique sound, colour, and style. These cars are safe for little hands (and mouths) and move when pulled back. Green Toys also makes chunky vehicles safe for babies, check out the school bus or ferry boat (which doubles as a bath toy). Cars are great for introducing little ones to concepts like stop and go, developing hand eye coordination, and gross and fine motor skills. The Hape Tap and Pound Bench includes several fun elements: balls, a hammer, and musical instrument all one! Little ones can work on their hand eye coordination while tapping the balls with the hammer, the balls will fall and make noise while rolling down the xylophone piece. One of the great features of this toy is that the xylophone part is removable, so on days when parents are not feeling the noisy toys this one can double as a slightly quieter version, and also the xylophone can be used on its own for music making activities. Melissa an Doug and B. Toys also make unique versions of this toy, which are more budget friendly options but still tons of fun to play with. Bath toys are a unique gift that will be enjoyed for years, My son received the Yookidoo Flow N' Fill Spout for his first birthday and it is still a favourite with both my little ones. Its great for one year olds who love to play with water flowing from the tap, without wasting more water. If you are looking for something a little more traditional, the B. Toys Fish N' Splish is a complete set of bath toys, which can be stored in the boat that is part of the set. For a more budget friendly option, Sandra Boynton's Bathtime! tub book does not disappoint. and absolutely loves it. It's interactive with a ball maze, lots of doors to open, and when the animals are placed on the barn floor they make noises and play a song (don't worry this feature can be turned off for days when parent's aren't necessarily feeling musical). Playmobil 1,2,3 also makes an adorable farm set that any one year old would love. Receive or give a great gift for a one year old that i missed? Have Let me know in the comments below. The air is crisp, the leaves are turning beautiful shades, and cozy sweaters are a playground must. Fall is here and I say embrace it! This year I have vowed to enjoy more time outdoors with the kiddies and with a few warm scarves and some extra travel mugs for pumpkin spice lattes it has been a lovely fall so far. This activity started with a simple walk around the block to collect some leaves (which Mr. Jeej insisted would be for a "special activity") and to look for signs of Fall. We got back from our walk a little late, and I knew I had to come up with an activity fast before lunch, or I would have two disappointed little people. 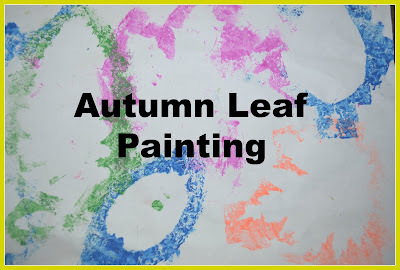 Luckily I had a few sponges and paint handy, thus the autumn leaf painting activity was born. This art activity requires almost no set up, you will need sponges (I cut a standard size rectangular sponge into smaller pieces for Baby E and Mr. Jeej's small hands), a few colours of paint ( we use the Crayola washable kind in the neon colour scheme for this activity, but fall-ish colours would also produce beautiful results), a collection of interesting leaves, and some paper. We started out by placing the leaves onto the paper and using the sponge to dab paint along the edges of the leaves. For Baby E, I find it easier for her and WAY less messy, if I squirt a few colours of paint onto a paper plate for her to use. It turns out that keeping the leaves in place was a little tricky for Baby E (19 months) and Mr Jeej ( 3 and 1/2). I ended up using a tiny bit of masking tape on the back of the leaves to help keep them secure, to help get a more recognizable shape of each leaf. It worked beautifully and both of the littles were thrilled with the results! This activity is an easy set up process oriented activity that could have tons of follow up activities. It's also a great conversation starter about negative space in artwork or about leaves in general. We happened to have Leaf Man and Red Leaf, Yellow Leaf by Lois Ehlert on loan from our local library. Both provide great examples of leaf related artwork! I think next time we will make leaf men of our own! 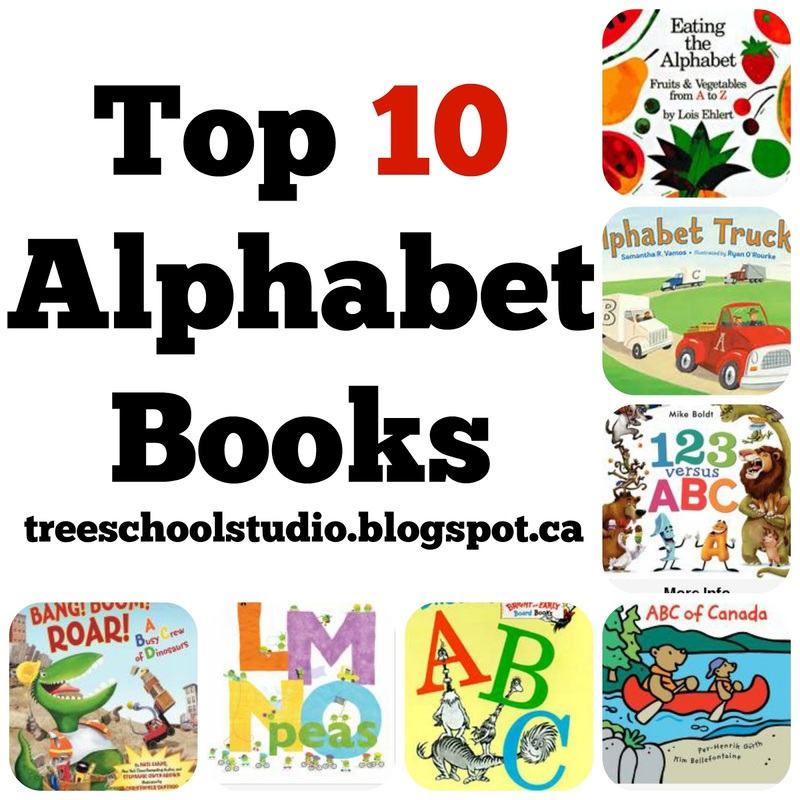 There are so many great alphabet books for all interests and age groups, these are our favourites! 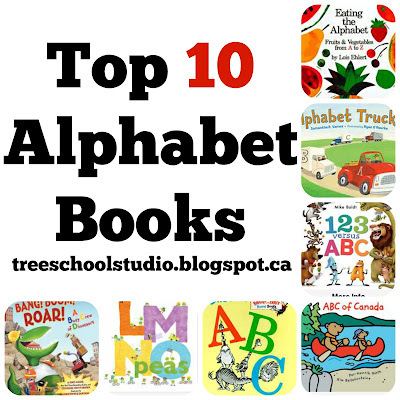 Reading alphabet books have tons of benefits for your little ones. They are a great way to introduce letters to small children, to teach them that each letter has a unique sound, to introduce them to (and sometimes even me, especially with some of the vehicle alphabet books) new vocabulary, and last but not least reading books of any kind helps you to spend quality time together. Even the smallest child can enjoy looking at the pictures and hearing the vocabulary that goes along with each letter. As with all Sandra Boynton books, this alphabet book does not disappoint in silliness and whimsy. It features animals and actions that correspond to each letter (Mr. Jeej especially loves "cats cleaning", its lead us to many conversations about why our cat doesn't have his own broom). Also, its available in board book form, which makes it a perfect first alphabet book for little hands (it was a lovely baby gift from a friend when Mr. Jeej arrived). This book was an all time favourite find at our local library. By the end of the lending period, this had become a staple in our bedtime and my (then) almost 3 year old had the entire book memorized. It was amazing, we would be out and see one of the trucks from the book and he would recite the entire page. With peppy rhyming text, cute illustrations, and 26 unique trucks, it would be hard for any 3 year old not to love this book. I love the colourful illustrations in this book! It introduces children to a plethora of new and favourite fruits and vegetables that go along with each letter. There are literally hundreds of follow up activities you could try with this book. You could have a handful of fruit on hand that are mentioned in the book and taste while reading about them. We like to read this book in the summer before heading to the farmer's market and then I have my preschooler try and find the fruit and vegetables from the book. You may even inspire your little ones to try a new veggie or fruit! You absolutely cannot go wrong with Dr. Suess. This book features classic and zany Suessical characters, including our favourite Zizzer-Zazzer-Zuzz, and tons of hilarious alliteration. Also, this is on of the few alphabet books I have come across that includes both uppercase and lowercase letters. It is so fun to read aloud with preschoolers and is sure to make even the crankiest 3 year old burst into laughter. I cannot get enough of the adorable and intricate illustrations in this book. Even if your child is a little young to grasp the concept of letters they will definitely enjoy discovering what the peas are up to on each page. This book moves through the alphabet with a variety of hobbies and professions being carried out by peas (Acrobats all the way through to Zoologists). This book makes a great baby shower present as its available in board book form. We came upon this gem on a bargain book sale table when we visited the reptile exhibit at the Royal Botanical Gardens in Burlington. This book is best suited to older preschoolers or kindergarteners as it includes great info about each reptile (who knew that a chameleon's tongue can grow up to two times the length of it's body?! or that some reptiles can squirt blood from their eyes?!). If your headed to the zoo, this could be a great book to read beforehand. Both of my little one's LOVE trains, making this alphabet book an easy favourite. I particularly enjoy this book as it includes trains from all over the world, which naturally leads to discussion about other places around the globe. It also includes a glossary at the end which gives the reader more information about the trains featured in the book. Bright illustrations and very simple text make this alphabet book perfect for even the youngest letter enthusiast. My little ones love the illustrations featuring cute animal characters enjoying uniquely Canadian places and pastimes (i.e. the Calgary Stampede and Niagara Falls). This book would make a great gift for international friends as an intro to Canada or to help foster a sense of Canuck pride in our local friends. This book features dinosaurs and construction equipment, the perfect yet unlikely combo that every preschool aged child is sure to appreciate! There is tons of fun rhyming text and alliteration that tells the story of a hard hat wearing crew of dinos while they move through the alphabet to create an adventure playground. Don't forget to share you favourites in the comments below! Summer is here! That means we try and take advantage of every nice day and spend as much time as we can outdoors. It also means that we can start to bring some of our more messy projects outside and let the rain take care of paint splatters on our deck! Last summer I was able to get a Little Tikes easel (special thanks to my mom who valiantly rescued it from the curb on garbage day) that we leave outside. To set up this activity all you need are a few spray bottles, I got mine from Dollarama and was lucky that I randomly grabbed 4 different colours, paper and some paint. 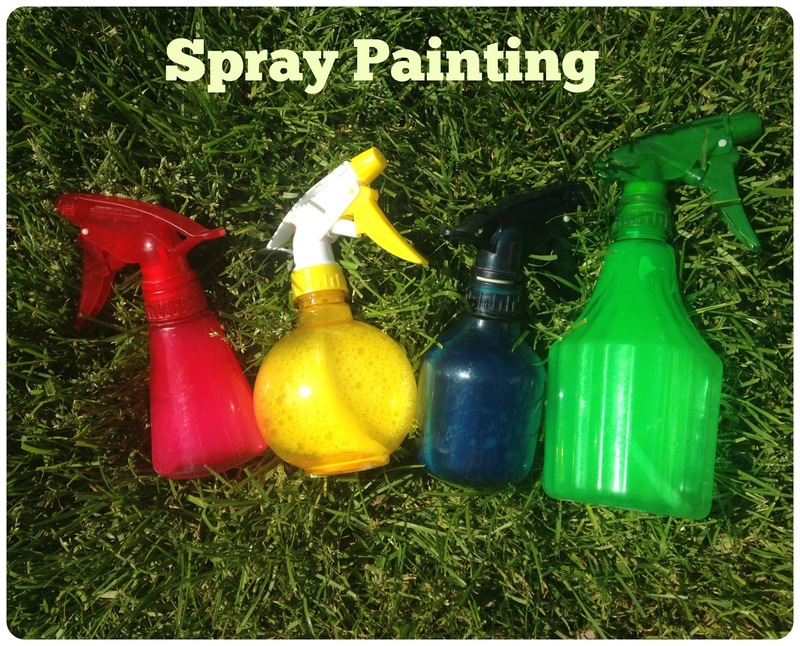 I squirted a small amount of paint into each bottle and filled them with water, the more paint you add the brighter the colour, that being said it’s important that your paint and water mixture is thin enough to easily spray. When your spray bottle as all mixed up, set out some paper and let your little one go to town. A word of caution though, it’s a good idea to make sure that anything you have hanging on a nearby clothesline should be removed ahead of time, those spray bottle sure are fun for preschoolers and let me say that the entire backyard ( and a cute little sister) had a healthy colourful splatter to it. This activity is absolutely perfect for preschoolers and older toddlers, my 3 year old Mr. Jeej loved it! It kept him busy for the latter part of an afternoon. Not only does it allow for ample creativity, it also leaves room for discussion about colour mixing. To enrich your art experience I highly recommend Herve Tullet's Mix It Up! . It's one of my all time favourite books for preschoolers. This activity also has a bonus fine motor component. The little ones will need to practice using their hand muscles to actually spray the paint onto paper, which is so integral for beginning to write. I did let my 15 month old Baby E try out the spray painting, she wasn’t yet able to handle to sprayer and the nozzle kept ending up in her mouth! Luckily Crayola has a lovely line of non-toxic paint! The end results are absolutely beautiful and it can be set up less than 5 minutes. Although, this is by no means a new activity, it's a favourite in our house. Getting cars all "painty" is always an easy sell with preschoolers. It's a very simple process oriented art activity that doesn't require much set up. All you need is paint, a handful of toy vehicles, and your choice of paper. I blobbed paint into a reusable tray so that Mr. Jeej would be able to dip his cars into the paint by himself. He (and just about every other preschooler) loves any opportunity to engage in something independently. For Baby E, I dipped the car, well actually monster truck (these were the easiest for her to grasp) in the paint and let her roll the truck around. She was super impressed with the result! Although my 11 month old really enjoyed this activity, I would say that if you'd like to try this with an infant, be prepared for a mess! Baby E loved to roll her truck onto the floor and watch the wheels create tracks on the floor as well. Mr. Jeej loved the idea that using different vehicles produced a different track mark on his page. 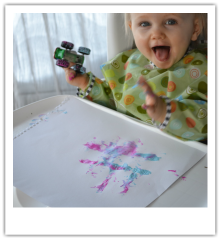 This activity provides endless opportunities for exploration with colour as well. He experimented with dipping each wheel I different paint colours. The result were gorgeous! Also, I will say that this is one of the few activities that Mr. Jeej actually is excited to help clean up. I gave him a bowl of soapy water, a towel, and the job of getting the paint off of the vehicle wheels. The whole painting and clean up kept the two littles engaged for over an hour, which is a huge success in my books! I'm a mama of 3 and literacy educator, follow us in our adventures in art, play and literacy!